Scroll to the bottom for soup pictures! Ingredients are sourced local, organic, sustainable or biodynamic. The highest quality, seasonal, and fresh produce! Flavors change with the seasons and availability of unique crops. Packaged in glass, not in plastic. Personalized Soups and Broths~ You know what’s best for you, and your nutritionist, herbal Doctor, Acupuncturist, etc, might have suggestions of herbs and vegetables that you need most! That’s why it’s always best to have food made for you. The great part is, if you buy a case of soups or broth from me, the price won’t be higher than buying it from the store, and you and I will talk about your specific needs and flavor preferences! Mentoring~ Sometimes our kids won’t always listen to us, but they’ll listen to someone else, about all kinds of things, like eating healthier! I work one on one with kids and teens, to get them excited, have fun, learn, and try new things. I have a background in theater and Hypnotherapy, which have taught me useful tools. Bulk Soups for Cafes, Markets, or Restaurants to be sold fresh~ Contact me for pricing on fresh, seasonal soups, sold by the gallon. Events~ Contact for cooking for events, school fundraisers, or pop up dinners. Vegetable Broths: Vegetable broth might be the healthiest drink we can have! You can drink it cold or warm. Some things that are used for medicinal teas, are tastier in broths or soups. For example nettles, reishi, chaga mushroom, suma root, fig leaves, and many more. I started getting serious about flavored vegetables broths, when I stopped drinking caffeine. Vegetable broths are gut healing, soul enriching, and full of good minerals! Flavors change often based on what’s in season and what’s inspired. The broths are canned in glass jars for longer shelf life. Although the use by date is printed as 3 months from the date it’s canned, these broths can easily last a year. They are sold in stores, in the refrigerated section. Roasted Tomato and Carrot, with garlic and basil. Individual size soups for stores, are in 16 ounce glass jars, that can be moved to the freezer. You can have it available fresh in the fridge for a few days, and then move it to the freezer section, and sell it within three months. To order for individual, weekly deliveries go to www.savraw.com. Soups are also available fresh for pick up at Mimosa Cafe in Topanga, CA, and in the frozen section of the Country Natural Food Store in Topanga. Vegetable broths are available at Erewhon in Calabasas, Mimosa, and the Country Natural Food Store, as well as delivery through SavRaw ‘Local Farm Box’. For more pictures, and stories follow @soup_sorceress (Kali Wnuck) on instagram. If you’re interested in supporting small farms, and carrying my soups and broths for your store, please contact me at 310-948-0123 or email, topangafoodies@gmail.com. Okinawa purple sweet potato soup with jujube broth. 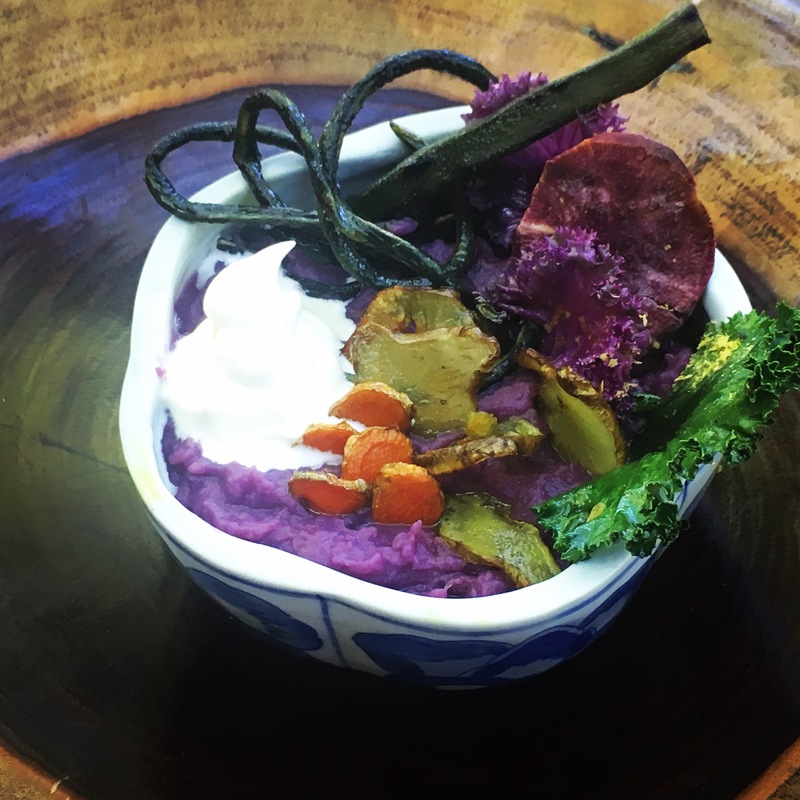 Crispy sunchokes and turmeric, purple flowering kale, purple Long beans, purple okra, and organic pastures raw whip cream. Roasted Heirloom Tomato Soup with Roasted Carrot, pulsed with fresh basil and freshly squeezed key limes. With my secret sauce (rosemary dream cream). Chocolate mole soup with whipped cream an chipotle powder. Chilled avocado soup with strawberry and dragonfruit salsa. Beet and lingonberry jelly (no sugar), soup with raw chocolate covered strawberry, almond cream, orange rind, and chocolate orange syrup. Topped with a little fresh basil. 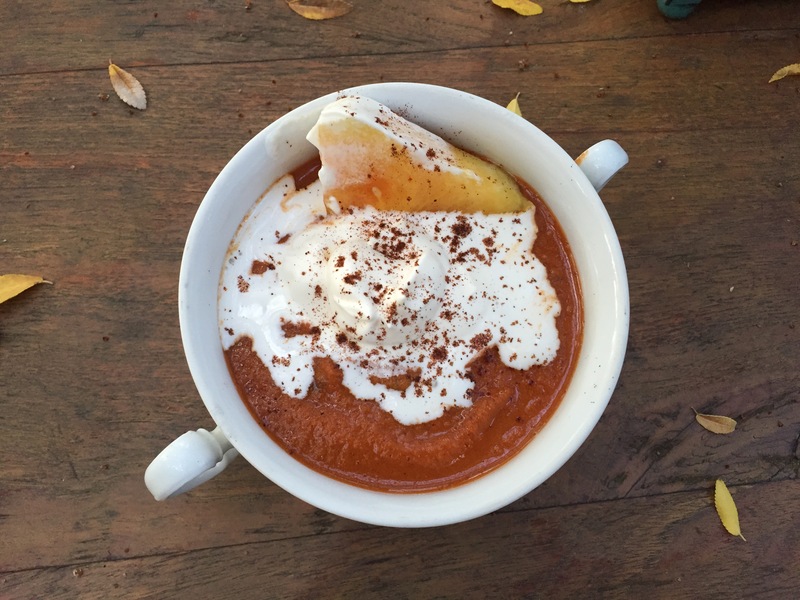 Creamy Japanese sweet potato soup with duck egg mayonnaise. Crispy turmeric slices, pickled purple carrots, fermented celtuce, and turmeric pickled quail eggs, with pickled onions and fresh basil. Avocado and Spinach, topped with Sauerkraut. Pureed asparagus and leek soup with roasted asparagus tips. Winter Soup. Layer of kuri squash puree with chili powder, and sweet potato with cacao. Topped with honey glazed orange peel, and chopped sautéed almonds in chili powder and olive oil. Celery root and fennel salad, with purple cabbage, blanched asparagus, pickled turmeric peas, parsley, fava beans, and baby greens. 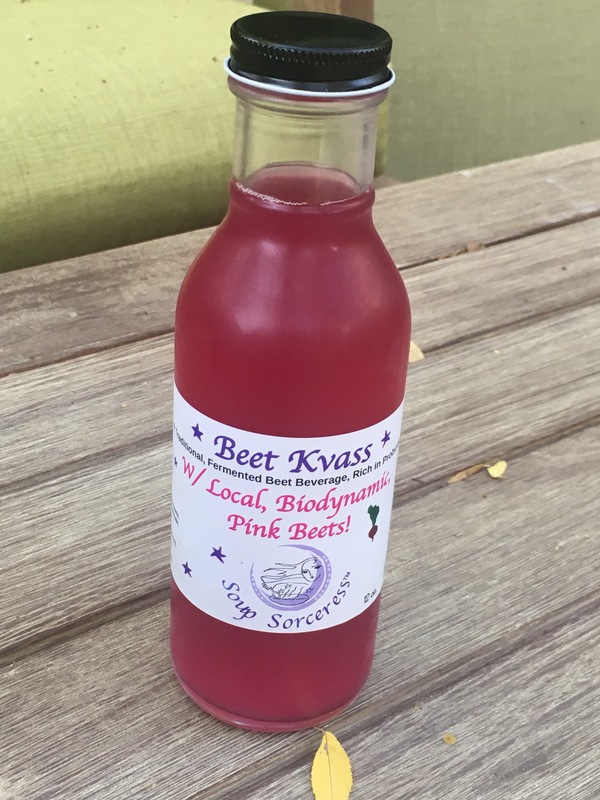 Beet Kvass. Fermented probiotic beverage.